It is critical to shore up areas of Africa’s Lake Chad Basin freed from the grip of Boko Haram, the United Nations Deputy Secretary-General told the Security Council on Thursday, as she also called for efforts to rebuild the lives of women and girls that have suffered at the hands of the terrorist group. Amina Mohammed said recent joint efforts by the four of the region’s affected countries – Chad, Cameroon, Niger and Nigeria – have resulted in “considerable progress” in the fight against the extremists, including the liberation of hostages as well as territorial gains. However, she reported that the group has stepped up the use of women and girls as suicide bombings, while children were deployed in 135 such attacks in 2017: a five-fold increase over the previous year. “It is now key to stabilize the areas that have been reclaimed, and that we seize the opportunity to really promote sustainable development,” said the UN deputy chief, speaking via videoconference from Liberia where she is participating in celebrations to mark the end of the UN peacekeeping mission in that country, known as UNMIL. Ms. Mohamed was joined by Mohammed Bila, a representative of the Lake Chad Basin Commission based in the Chadian capital, N’Djamena, and Senior Conflict Advisor at Adelphi, Chitra Nagarajan, in painting a picture of the factors behind people’s suffering in the Lake Chad Basin and driving some to terrorism one year after the Council adopted its first resolution on the activities of Boko Haram in the strife-torn region. Boko Haram, an Islamist militant organization based in north-east Nigeria, has carried out raids, suicide bombings and kidnappings across the Lake Chad region over the past decade. Their operations have led to displacement, insecurity, destruction of infrastructure and what Ms. Mohammed described as a “complex and dire” humanitarian situation, with nearly 11 million people requiring assistance. The group gained international notoriety in 2014 after abducting more than 270 girls from a Government school in Chibok, Nigeria. It is believed to be behind the kidnapping last month of 110 schoolgirls from the Nigerian town of Dapchi, most of whom were safely returned this week. 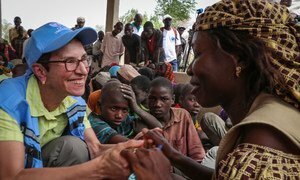 Overall, Boko Haram has abducted more than 4,000 women and girls, according to the UN deputy chief, who added that those who return to their communities are often stigmatized. As the violation of human rights continues to fuel insecurity in the Lake Chad Basin region, Ms. Mohammed said investing in community justice mechanisms will be essential for reconciliation, as well as for ensuring accountability and promoting peace. She stressed the need to incorporate human rights and gender dimensions into activities aimed at countering terrorism or preventing violent extremism. For example, she said the increase in Boko Haram’s use of women and girls as suicide bombers could be due to a lack of women security officers who can search other women at checkpoints. And she called for more international action to support children affected by the upheaval in the region. Chitra Nagarajan, a Senior Conflict Advisor with the think tank Adelphi, who is based in north-east Nigeria, also used her briefing to touch on the gender-related aspects of the crisis and also its impact on persons with disabilities. In addition to the threats outlined by Ms. Mohammed, she spoke of how women and girls are pushed into early marriage with combatants, for example, or they fall victim to sexual abuse and exploitation, including at the hands of people who are supposed to protect them. “Men and older boys are often the first to flee insecure areas,” she said, speaking via videoconference from the city of Maiduguri. The Security Council meeting took place as the United Nations marked World Water Day, which focusses attention on the importance of managing freshwater resources. Mohammed Bila, a Remote Sensing Expert with the Lake Chad Basin Commission (LCBC), a decades-old initiative to regulate and control the use of water and other natural resources in the region, spoke of how climate change has had an impact on water governance. He said the shrinking of Lake Chad has affected communities which depended on its shoreline to grow crops, leading to increased competition for water, accusations of river diversion, loss of livelihoods and social tensions. He told the Council that the environmental monitoring network there is “inadequate, sparse, poorly funded and operated,” with only one water level measurement station for the entire lake. “The environmental challenges facing the Lake Chad basin are interconnected to the challenges of climate change faced by the region of the Sahel of Africa,” he said. Amid growing insecurity in Lake Chad, a senior United Nations relief official on Monday said the international community and the Government of Cameroon must step up support for humanitarian action in the country, which is most affected by regionwide violence sparked by Boko Haram.